Doctor’s offices and Retail Clinics deal with thousands of patients a year- and virtually every patient contact requires disposal of some type of medical waste, from syringes to cultures to contaminated gloves. Since these items can’t be simply thrown away, it’s up to the clinic and office to find a reliable, safe system to dispose of all the medical waste they produce. Medical Waste Pros can help minimize the expense, ensure compliance, and help you manage your medical waste properly. We can help you dispose of regulated medical waste, pharmaceutical waste, and more. 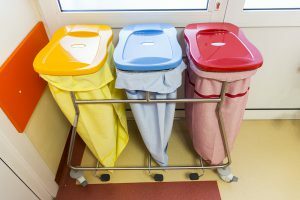 Although the regulations and requirements for doctor’s offices and retail clinics vary by state, in most cases using a medical waste disposal company is the most affordable and efficient way to handle medical waste. Medical Waste Pros will find a local provider to help you dispose of, transport, and decontaminate your medical waste. Medical Waste Pros can help you find a reliable local provider to help you with medical waste disposal and medical waste management for sharps disposal, regulated wastes, biohazard disposal and more. To get started, fill out the form to the right, or give us a call at (888) 755-6370. Within minutes, we’ll get you free, no obligation quotes within minutes!